Do you keep buttermilk in your fridge? I do. Sometimes I make my own, sometimes I find it marked down at the grocery store and buy it. Once I saw a half gallon for 15 cents (on the sell-by date). You bet I snagged that bottle in a hot minute. 15 cents! What do I do with all this buttermilk? I'm glad you asked. I use it in a bunch of different muffin recipes. The key recipe is here, and there are many more variations to the right ------> in my Recipe Index by Category. I also use buttermilk in waffle batter such as this one. I'm encouraging my son to pick up the skill of biscuits, so he'll be following this recipe. And this summer, once all the bottles on the door of the fridge are used up, I am going to make this Buttermilk salad dressing. But today, because it is Friday, I want to talk about pizza dough. Buttermilk in dough makes a tender crust. It's also got subtle tang that works great with sweet (ok, more like sweeter, I have yet to make a dessert pizza) and savory toppings, as you'll see today and in the future. My recipe is from my favorite pizza book, The Best Pizza Is Made at Home (Nitty Gritty Cookbooks) , by Donna Rathmell German. I kept it basic this time, but there are more variations on tap (and currently in my fridge! Check my FB page for the pizzas we're eating tonight using a whole wheatier Buttermilk Pesto Dough). Generally, when I am sharing a new dough variation, I tend to keep the toppings pretty normal. I mean I didn't want to freak you out like I did with the beet crust dough for vegans, vegetarians, or omnivores. 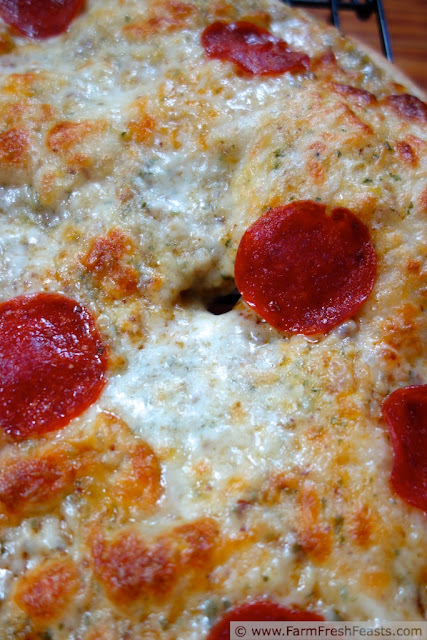 Today is no exception--as you can see by the title, it's a pepperoni pizza. Like my Not So Simple Cheese Pizza, this pizza uses the wonderful Fresh Tomato Pesto I discovered when Heather put it up on In Her Chucks. Since I spent fall and winter figuring out how to make, put up, and subsequently use many variations of that pesto, it has earned its own "how to" blog post which will be coming out next week. Around these parts, that's before the fresh tomatoes show up--but don't run out and buy a well-traveled tomato. Wait. Patience is a virtue. Local tomatoes, like local strawberries and local celery, just taste better. Life is too short to eat tasteless food. Please follow my Pizza Primer for pizza dough making instructions as well as general tips and notes on making pizza at home. 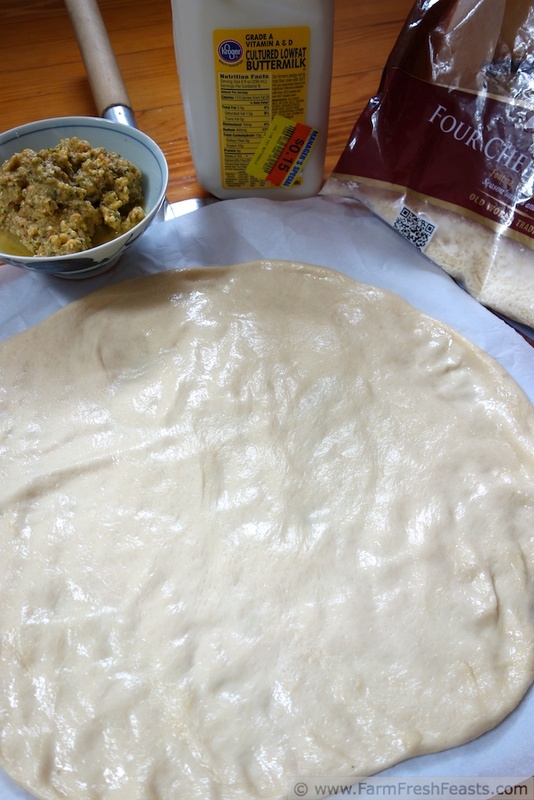 I like my dough to hang out for at least a day and up to three in the fridge, since old dough doesn't talk back like my teens do fight me, so start this at least a day before Pizza Night. Place buttermilk and yeast in the bowl of a stand mixer, and allow to hang out together and dissolve while you're getting the rest of the ingredients together. I do pour the buttermilk straight from the fridge, without warming it up, because I figure I'm not really asking the yeast to go bonkers just yet, so if the dough is a little chilly it's OK by me. Add the rest of the ingredients (love my kitchen scale!) and mix with the paddle slowly for a few minutes. Stop and scrape the sides, then mix at a higher speed for a few minutes, before turning down the speed to medium-low. When the dough is stretchy, with mare's tails trailing out (a meteorological reference, anyone?) you're good to go. Transfer to an oiled bag or bowl and refrigerate until you're ready to use it. You can also freeze this dough if you're not going to be using it within a week--if so, please label the bag so you know what kind it is. Trust me. On the day of baking, set the dough out on the counter about 2 hours before you're ready to bake. An hour before you're ready to bake, preheat your oven to 425 degrees Fahrenheit with a pizza stone inside (yes, I wrote a poem to my pizza stone). If you don't have one, use a cookie sheet until you can hit a thrift shop up and snag one. On and oiled piece of parchment paper stretch the dough into a shape that floats your metaphor. Spread with Fresh Tomato Pesto, licking your fingers with the excess because it truly is awesome. Or red sauce. 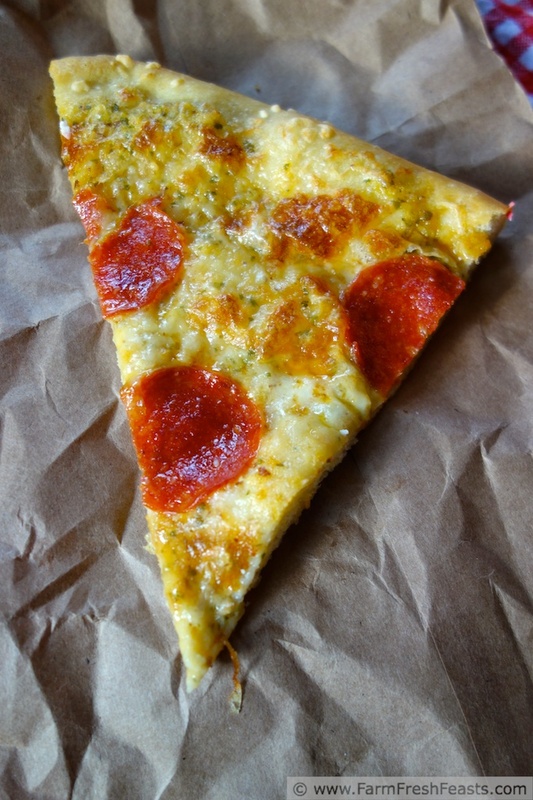 Top with cheese and pepperoni. Take a few pictures. 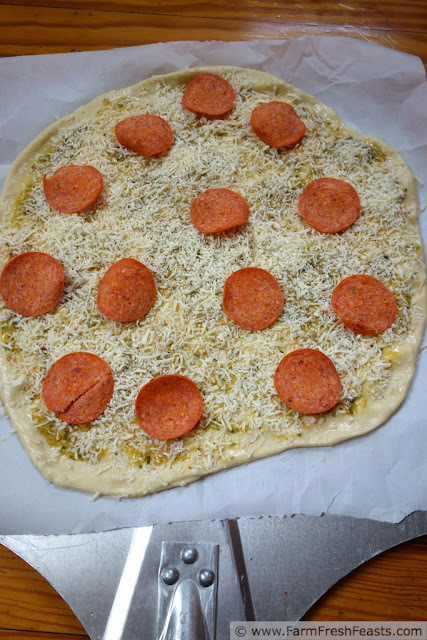 Bake, on the piece of parchment on the stone, for 5-8 minutes, then shimmy like your sister Kate the pizza off the parchment and directly onto the stone or cookie sheet. Bake another 3-5 minutes until the cheese is browned and bubbly. Slice and serve. Then get some fancy vinegar because the variation I made with another batch of this dough is a Raspberry and Goat Cheese with Pomegranate Reduction on Buttermilk Crust Pizza. Too high falutin' of a name for me. Maybe I'll call it Bubba Pizza. Yep, there's a hole in my crust. I do feel stretched kinda thin these days. "Life is too short to eat tasteless food." Yes! I agree 100%. I just may give this a shot, as I think I'm making BBQ chicken pizza this weekend... a new pizza crust sounds like a good spin on things. Last nights whole wheatier buttermilk pesto dough was just amazing--so tender and fluffy. I use buttermilk a lot. I also look for it to be on sale, because first of all, it is good to use for at least 30 days after the code date - if it isn't moldy, I'll use it for baking. If you plan to use it for baking, it can also be frozen - it might separate a little when it thaws, but it will be fine to use. It also makes great creamy salad dressings, though I only use the fresh stuff for that. I'm so glad I'm not the only one not frightened by sell by dates! At the food bank we keep dry goods a full 18 months after their 'best by' dates, so it's like the Pirate Code to me "more of a guideline, really" (we've been watching a lot of Pirates of the Caribbean lately). Kirsten, this looks great! How nice to have a CSA, too. And a helper for your photos! I'd give anything for that! If the photo helpers would just pick up their backpacks off the floor, and put their dishes in the sink, and wash their own laundry . . . . they tend to create more work, now that I think about it. Hmmm. I suppose it's too late at this point ;) . I'm waiting to hear about your pizza! You may call her Shirley. Perhaps I'll incessantly blog about the biscuit process, complete with photo collages, so we can all share in the joys. I love buttermilk! I have used it in just about everything, except pizza dough. Now I have another thing to try! I have a list of recipes to try that gets longer every day (many of them are yours!). Thanks! My list of recipes I've made & photographed that need to be turned into blog posts is long, and getting longer every day. I don't know which is worse? I never know what I'm going to make until I get ingredients in front of me, but I know what I've got to write up! Looks delicious! I always love trying out new dough recipes! I love using up stuff I've got in ways that the kids will eat, which translates into pizza dough fairly often. What a pizza! Thanks for linking up with What's Cookin' Wednesday! Thanks for pinning this! I appreciate it! you had me at .15 cents. And just in case you ever find another killer deal...here is my recipe for buttermilk pancakes. http://inherchucks.com/2012/06/02/buttermilk-pancakes/. Thanks for your pancake recipe--my daughter is branching out this summer and working on pancakes, so we'll try it. Buttermilk is marked down a surprising amount if you know where to look, at least around here. 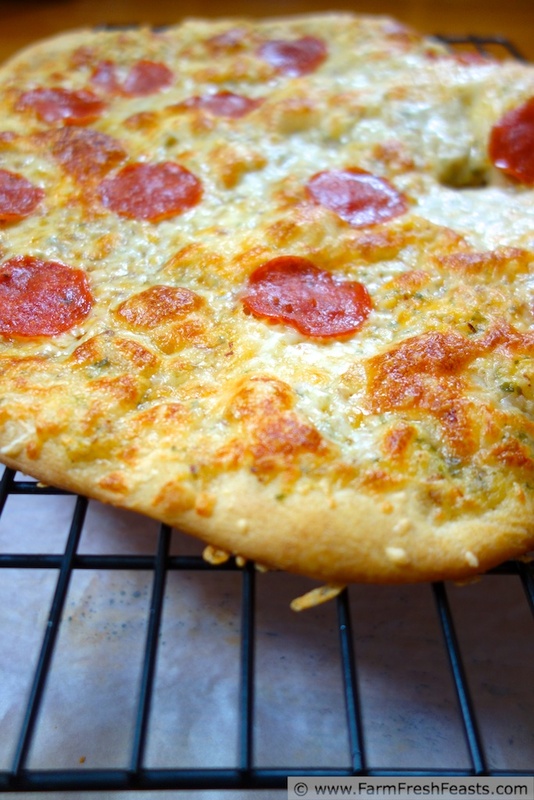 This recipe is different from the one that I use for my pizza, but sounds really good. I am going to try this one. Thanks for sharing. Sift flour and salt into you kneading bowl. In a Mason/Ball quart jar, add the buttermilk and honey. Shake the two together. Place quart jar into lightly boiling water until it reaches 110 degrees. Stir/swirl jar while bringing up to temperature. Add yeast, cover with cap and shake for a few seconds. Remove cap and let activate for about ten minutes. Add liquid to flour and turn kneading hook mixer (kitchen-aid) on to setting 1 for five minutes. Let dough rest in mixer for five minutes then turn mixer back on for another five minutes on setting 2. Split dough in half and place in olive oiled bowl/dough pans. Place in refrigerator for at least 24 hours (can go several days). Bring out of refrigerator at least an hour (better two) prior to baking pizzas. Thanks for this recipe, I appreciate it! I'm also appreciating having a kitchen scale that can switch back and forth between ounces and grams--my brain gets tired of converting.